Nike, a teenage girl from ancient Sparta, narrates her pursuit to become not just the fastest female runner in Sparta but the fastest athlete in Greece. A jealous Spartan princess, an overprotective mother, a childhood friend who Nike still can’t quite beat, and the societal pressures to become a wife and mother are just a few of the obstacles she faces during her quest. The very first title I used was The Spartan Athlete, but I chose this mostly so I had some kind of title for it instead of saying “my novel” all the time. I wasn’t set on this title because I think it’s a little too plain. I was certainly not about to change my title to The Naked Athlete or anything ridiculous like that, but this comment did bring to mind a new title: Thigh-Flasher. 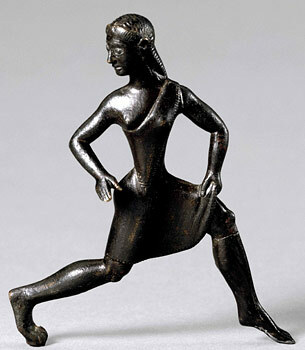 This was the term that Sparta’s rivals, particularly the Athenians, called Spartan girls and women because they wore short tunics that were only mid-thigh length, whereas all other women in Greece wore garments that reached the ground. Thigh-flasher was supposed to be a derogatory term, but Spartan girls and women were proud of their bodies and athleticism and thought of it as a compliment. So, I chose this phrase as my new title. Now I’ve been working with my agent on my novel and I'm back to square one with a title. She thinks Thigh-Flasher is detrimental to the story, especially since she thinks it should be marketed as Young Adult. For a few brief weeks I changed the title to Goddess of Victory, but I liked Thigh-Flasher too much that I changed it back. But she tells me this is too “chick-litty” and I guess if you don’t know the context of the phrase, she’s right. Sooo… I'm trying to think of alternative titles. I'm keeping a running list on the notepad on my desk. None of them are really sticking, but I’ll keep thinking about it. Until further notice, my novel is currently Untitled. I really like the Thigh Flasher title. And I consider myself a cautious person. To me it doesn't seem risque. Good grief - YA books are very edgy - often much more so than I am comfortable with! Seems to me the title is something you'll be getting input on from an editor soon! She/he may love Thigh Flasher. Thank you for the title support! If/when I get an editor, I will resume the fight for my title of choice. This IS a subjective business. And I'm sure I'm not the only writer who has disagreed with her agent..